POWNAL — The tall gray former racing horse reared up and pulled on its rope. The small group of riders in the arena with their horses at Wilden’s Run Farm watched as horse trainer Dan James told Tara Dee Ratzer not to back down. She used the whip as Summer Dancer pulled away, until he walked — somewhat — placidly in circles around her. “It’s not easy to stand your ground, when you have a horse coming at you like that,” James told the group at the end of the morning’s exercises — part of a three-day horse training clinic at the farm. “In that moment, back there — he had to back down,” James said of the horse. 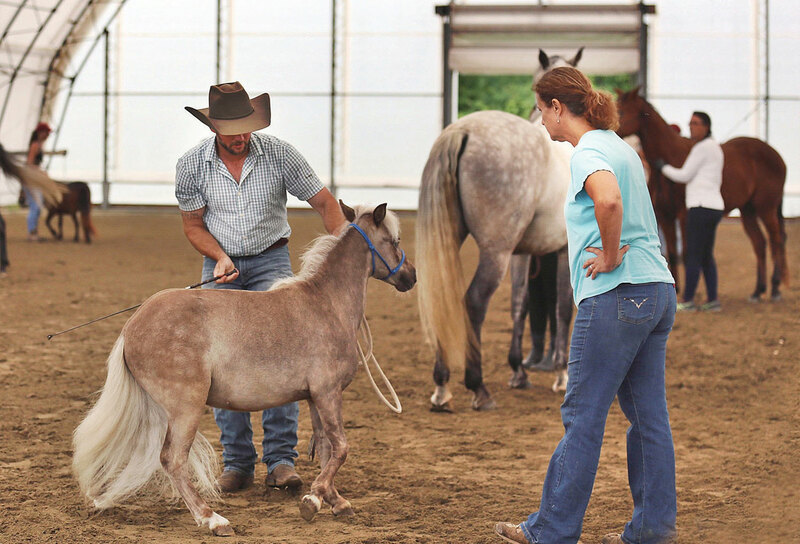 James, an internationally recognized horse trainer, will spend Friday, Saturday and Sunday at the farm giving seven riders a foundation in “liberty training,” in which a rider directs a horse with just a whip, without a halter and lead rope. “When people see it … it looks like a magical type connection,” said James, who is based in Lexington, Kentucky. Liberty training is a commonly requested clinic topic, he said. Through the morning, James instructed the group of seven riders, wide-ranging in experience levels, through leading their horses. He had them lead the horses through various exercises, including walking in a circle around them and backwards in the dirt-floored arena. He helped individual riders as they go. “When you think that she has gone where you wanted her to go, stop the whip,” James instructed Frank Lotano, 15, of Glenville, New York. Lotano handled Mickey, a brown-and-white female horse. She often stamped her feet as Lotano lead her through the exercises. James reminded the group to acknowledge that humans learning a new skill with a horse will want to repeat it again and again, when that might not be the best for the animal. A key component of training is to provide an equal amount of “release” as correction, he said. “Like any animal, any person — if you push them hard enough … you’re going to get a fight,” he said. If there’s too much correction compared to release, the horse will learn to resent the trainer, he said. 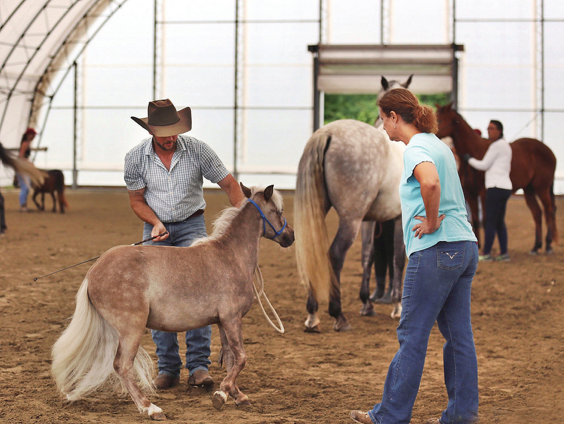 James, along with Dan Steers, owns Double Dan Horsemanship, a horse-training company. He trained the original horses in the TV series Heartland in lying down and rearing. Full liberty training can take years, so the weekend’s clinic will offer a foundation in the training, he said. Ratzer said she also wanted to use the training to improve her skills, which she can use to develop the farm’s five sale horses. “For me, the whole liberty training is just majestic and beautiful,” she said. Ratzer, originally from Red Hook, New York, purchased the farm in December 2017. She has been riding horses since she was 3 years old. The training is his first clinic. “It’s just a different approach,” said his mother, Jennifer Lotano. Jennifer Lotano is Ratzer’s aunt. She rode horses as a child, and then took a long break. She’s been riding as an adult since about 2006. She brought her horse, 7-year-old Gianni, to the training. Training is everything for a horse, said Rita Dee, Ratzer’s mother. Horses with the least amount of training are often the ones that wind up going to slaughter, James said. With education like liberty training, that can be a made less likely scenario. Training is about two things: keeping people safe, and educating the horse, he said. “Horses are an incredibly beautiful animal, but at the same time, they can kill you in a heartbeat,” James said.